Toy versions of Mars spacecraft, sans Phoenix that landed on the red planet on Sunday, May 25. — There is a scene in the 1995 feature film "Apollo 13" when Tom Hanks as astronaut James Lovell demonstrates to his son how the Apollo lunar module flies to a landing on the Moon using a toy model of the lander. "And I take the controls, and I steer it around, and I fly it down, adjusting it here, the attitude there, pitch, roll... for a nice, soft, landing on the moon," explains Lovell as he simulates the movement of the spacecraft with his hand. NASA's Phoenix spacecraft, which safely touched down within Mars' northern arctic region on Sunday, followed a similar, though unmanned, autonomous approach to the surface, becoming the first lander to descend onto the red planet using thrusters since twin Viking missions in 1976. Unlike the Apollo module or earlier Mars landers however, there are no toy or model versions of Phoenix available to parents, teachers, children or collectors to recreate the spacecraft's dramatic entry, descent and landing that was described by the mission's officials as "seven minutes of terror". Phoenix, as only the sixth lander to safely touch down on the surface, is the only one that hasn't been packaged for sale as a toy or model kit. The year before NASA launched its first Mars rover, the Sojourner, on-board the Mars Pathfinder mission in 1996, Mattel, Inc. came to the Jet Propulsion Laboratory (JPL) to discuss creating a miniature model of the six-wheeled Martian terrain vehicle. "Who could help but become intrigued by the Mars Pathfinder mission... after seeing this intricately accurate mini-version of the mission's mini-rover?" asked a JPL official in a media statement issued at the time. When the spacecraft touched down on the red planet on July 4, 1997, the "Hot Wheels JPL Sojourner Mars Rover Action Pack" landed on store shelves. And then they immediately flew off store shelves. Mattel had a difficult time keeping up with demand. 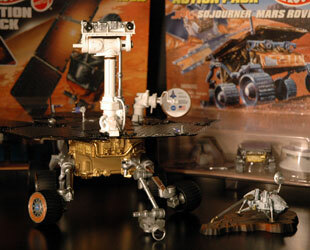 The set, which included the rover, its lander and the aeroshell that protected it during its entry into Mars' atmosphere, went through several package redesigns and was even offered by the toy company as a limited edition, plated in 24 karat gold. It was therefore of little surprise that Mattel would choose to follow up their success with another set of toys for the next series of Mars spacecraft. 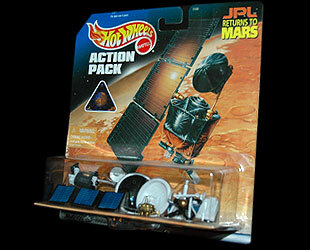 Shipped to coincide with the arrival of NASA's Mars Polar Lander in 1999, the Hot Wheels JPL Returns to Mars! Action Pack again included three miniature vehicles, including NASA's Mars Climate Orbiter and the Deep Space 2 microprobes that would be deployed during the polar lander's descent. Once again, the set gained popularity, though for different reasons than Mattel had hoped. Unfortunately for NASA and Mattel, all three spacecraft failed. Miscalculations led to Climate Orbiter being destroyed. Polar Lander and its companion microprobes ceased to respond after starting their descent into the atmosphere. Rumors of a recall fueled collectors' interest in the packs, which quickly appeared for sale on sites such as eBay, sometimes retitled as NASA's 'Crash Pack'. Even so, the sets largely ended up in clearance bins months after the unsuccessful events on Mars. The losses emphasized the risks involved with launching spacecraft to Mars, not to mention tying products to their success. In the history of Mars exploration, more than 40 missions have been launched with just under half failing. The odds may have been too daunting for Mattel, which to date has yet to show interest in producing a new Mars lander toy, but their departure opened the door to others. When the Mars Exploration Rovers Spirit and Opportunity successfully landed in January 2004, two toy companies were ready, with a third waiting in the wings. Danish toy maker Lego offered a build-your-own model of Spirit using their popular snap-together bricks. The 858 piece toy set was aimed at children of 10 years or older. 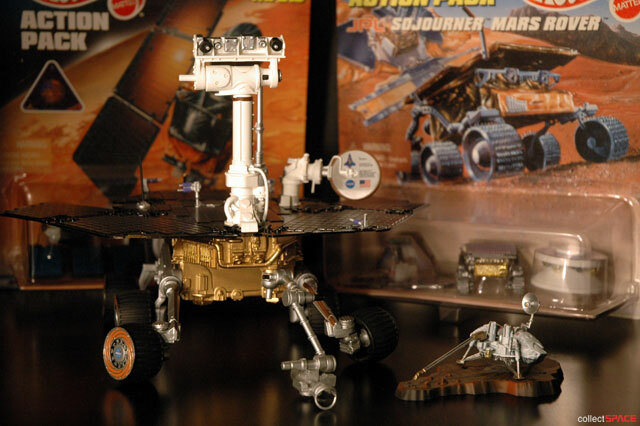 For collectors and Mars enthusiasts, Code 3 Collectibles offered a one-tenth scale model of the rovers, complete with moving wheels and instruments as well as a Martian surface base. The limited edition, $150 replica sold out. Nearly two years later, with the twin rovers still exploring Mars, Sun Star Models released a 1/18th scale model of the wheeled-spacecraft. Offered through specialty stores worldwide, supplies were consistently quickly exhausted. So what was it about Phoenix that kept toy companies at bay? 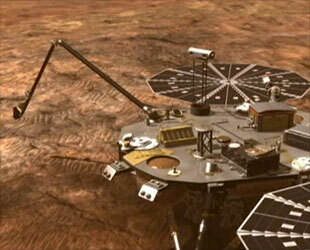 Could it be a sign that interest is waning in the Mars spacecraft? "Maybe," said Chris Lewicki, the lander's flight systems engineer, in an interview with collectSPACE last week. Lewicki felt there might be other factors at play, as well. "Phoenix doesn't have wheels, and isn't coming out of the high drama of two Mars mission failures as [the rovers] did," he said. Were a company interested in producing a toy or model, they would need to seek a license from the California Institute of Technology, which manages JPL. Unlike other NASA missions which designs are public domain, JPL maintains control over the use of the vehicles it manages for NASA as a result of its public-private partnership with the government space agency. A JPL spokesperson reached by collectSPACE said that at this time they were unaware of any requests to use the Phoenix for a toy or model. Lewicki would have liked to see otherwise. "I would like to see that realistic replicas are available for all spacecraft (including orbiters), but there often isn't much demand. The most realistic models are restricted to custom-built models used by JPL and NASA, which can't be affordably mass-produced," he explained.